ABS-CBN, the leading TV network in the Philippines announced today the schedule of activities for the Grand Kapamilya Weekend to be held this Saturday (Oct 5) and Sunday (Oct 6) 2013 in Quezon Memorial Circle, Quezon City and various areas nationwide. The historic celebration is part of the 60th anniversary of Philippine television. “It’s Showtime” will hold its live telecast in Quezon Memorial Circle (QMC) this Saturday. ABS-CBN film production outfit Star Cinema and radio station M.O.R. 101.9, meanwhile, have back-to-back treats for the QMC crowd. At 5:30 PM, Star Cinema will hold a free outdoor screening of the box-office movie “It Takes A Man and A Woman". It will be followed by the appearances of Piolo Pascual and the stars of the upcoming Star Cinema movie “She’s The One,” Bea Alonzo and Enrique Gil. M.O.R 101.9 will treat the crowd to a free “MOR LIVE: Kwento ng Musikang Pilipino” concert at 8:30PM, featuring performances from Daniel Padilla, Jed Madela, Yeng Constantino, Jovit Baldivino, Juris, KZ Tandingan, Bugoy Drilon, Liezel Garcia, Marcelito Pomoy, Bryan Termulo, and “The Voice of the Philippines” artist Darryl Shy. “One Run, One Philippines,” on the other hand, will kick off the festivities on Sunday at 6AM, with thousands of participants gathering to run for the continued rehabilitation and beautification of the esteros in the metro and the Pasig River. The run will also be simultaneously held in Quezon City, Cebu City, Bacolod City, Davao City, and Los Angeles (USA) to benefit various environmental advocacies. The Kapamilya channel musical variety program "ASAP 18" will bring world-class performances live from the Marikina Sports Complex. At 5PM on the same day, comedians such as Pokwang, John Lapus, Pooh, Kitkat, K Brosas, and Chokoleit, among others, will be headlining the Kapamilya TV for an evening of laughter, contests, and prizes. From 8AM to 6PM on both Saturday and Sunday, Kapamilya attendees can troop to the Kapamilya Village in QMC, where ABS-CBN programs and channels will set up booths offering games and special shows. They will also be given the chance to bond with and have their photo taken with some of the cast members of ABS-CBN programs who will take part in the event. The Kapamilya Bazaar at QMC, meanwhile, will open at 9AM until 12MN on both Saturday and Sunday. Aside from these fun-filled activities, the “Grand Kapamilya Weekend” will provide public service through the medical mission of “Salamat Dok” and DZMM, the Soup Kitchen to be operated by Star Magic talents and ABS-CBN’s news anchors, and the booths of ABS-CBN’s news and current affairs shows. The ABS-CBN Regional Network Group will also deliver medical, livelihood, and government services to the public via “Halad Kapamilya,” which will begin at 6AM on Saturday and will be held simultaneously at SM City Bacolod, Cebu Technological University, and Palma Gil Elementary School in Davao City. 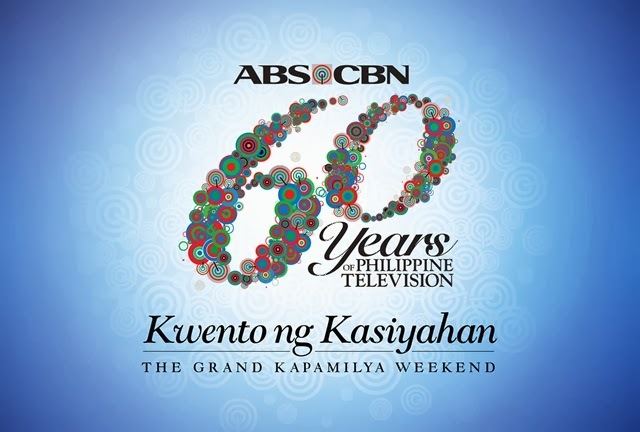 Additional information on the “Kwento ng Kasiyahan: The Grand Kapamilya Weekend,” can be checked at 60years.abs-cbn.com. Be part in the celebration by sharing your ‘Kwento ng Kasiyahan’ on Twitter using the hashtag #Kapamilya60Years.